The New Zealand Racing Board (NZRB) is using control and monitoring technology from German broadcast company Lawo to further revise and streamline its production model. NZRB is now operating four OBs instead of six, with three Mercedes Sprinter vans and a fixed site to cover metropolitan race events from a central control room, using Lawo’s Virtual Studio Manager (VSM). The move follows the 2017 creation of the NZRB’s Vision Capture Project which was devised to take the company beyond established broadcast workflows and OB. 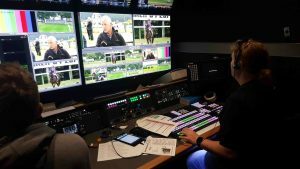 In 2017, and with OB trucks that were close on a decade of very hard use, the NZRB faced 1,100 OB days racing across the country each year, the number of events and variety of scale pushing its previous production standards and raising the opportunity of mixed OB and remote production. Following moving to an IP Layer 3 network, Phase 2 of the project saw the NZRB teamwork with Sony on four HD-capable and scalable OB trucks to cover its existing and very demanding nationwide OB workflow. As part of this design, the NZRB team identified VSM as integral to achieving the same flexibility and scalability as seen in a remote production model, allowing the shared use of ‘Expansion’ vehicles to seamlessly enhance capabilities such as extra workspaces and camera count. VSM provides operators with overarching control over their systems in an extremely adaptable way; user panels and interfaces can be configured without limitation in order to meet the requirements of different workflows and applications, with the whole system under redundant control. “One of the key selling points of VSM was the portfolio of support and compatibility for third party protocols, in addition to Lawo’s own products with Ember+. This was key given the wide range of products used in the design of the HD OBs, without compromising on capability,” said NZRB broadcast engineer, Michael Tompkins. The OB design had to maintain the NZRB’s ability to cover the full extent of its racing, but be physically smaller in size, while also providing greater cost efficiencies across the production. Internally, the trucks had to provide cost efficient yet scalable industry-standard capabilities, requiring VSM to provide integrated control of switchers, routers and a replay server as well as the connecting network. The basic daily OB set up for a truck covers running up to ten system cameras, with capacity for 12 and other SDI, commentary, presentation area and roaming interviews, on a typical day internal crew is director/vision switcher, sound op, replay op, engineer and a vision control op, all operating from within the truck.